Sinn Fein spokesmen have been queuing up to express disappointment at what they complain is a lack of unionist leadership. Where have they been? 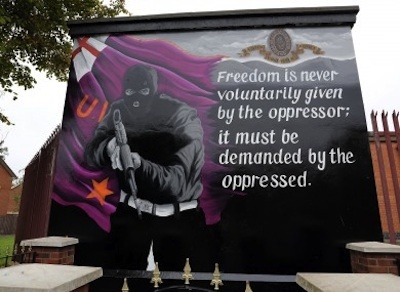 Perhaps they have read no history but most of them have lived through the whole period of the Troubles and therefore the present stance of unionist politicians should come as no surprise to them. Unionists have always used violence or the threat of violence to get their way. For them to join in common cause with the UVF in north and east Belfast is entirely consistent with past behaviour. Forty years ago exactly senior figures in what was then the Official Unionist Party and the DUP sat down with loyalist terrorists to conspire to destroy any attempt to establish a power-sharing executive. The following year 1974, members of both parties sat around the table with the UDA and UVF to organise and carry out the UWC strike which brought the north to a standstill. Just run your mind over all the other instances of unionist politicians standing four square with men from organisations which were relentlessly killing Catholics. Indeed unionists voted men from the same organisations into ceremonial positions in councils. Then there’s the ‘Carson Trail’, the ‘Third Farce’, the 1986 ‘Day of Action’ against the Anglo-Irish Agreement, not to mention Ulster Resistance with Peter Robinson looking ridiculous in his red beret and glasses. Why then should anyone in Sinn Fein be surprised or disappointed to find Robinson throwing in his lot with the wilder shores of unionism? Don’t forget Robinson has form. Form in the shape of a criminal conviction for leading a mob into Clontibret which terrorised the village and injured two gardai. After a brief flirtation with moderation in 2011 Robinson returned to form last year when he belatedly added his name to the notorious letter signed by practically every senior unionist elected in Belfast which attacked the Parades Commission and encouraged defiance of its determinations. Oh, and by the way those determinations have the force of law though we’re all waiting (but not with bated breath) for anyone to be convicted for a breach of a determination. What we’re witnessing in the last year is a unionist counter-revolution against the Good Friday Agreement. Piece by piece and bit by bit unionists are working to dismantle the agreement. They have stopped working the executive. It operates only in sectarian silos, each department a law unto itself. Robinson’s unilateral U-turn on the Maze/Long Kesh deal means that there is no Programme for Government any more, not mind you that it was operative. However, Robinson’s U-turn on an item in the programme is a precedent which means that he can walk away from any item with impunity. You can spot the next target easily because Robinson’s next position is Jim Allister’s current one. Whatever Allister sets his sights on is where Robinson will be in a couple of months. Therefore the next target is the definition of victim. Unionists will refuse to operate any deal on the past until republican victims are excluded from it. In this context the fact that after meeting Dr Haass unionists scuttled up to Twaddell Avenue to signal solidarity with the Orange Order and UVF is highly significant. Letting loud mouths from the order do their dirty work has always been normal practice for unionist politicians. You stand behind them on the platform and in the case of Nelson McCausland last weekend applaud with your hands below your waist so the crowd and journalists, though not the cameras, can see but your presence endorses and justifies the remarks. You can see why Sinn Fein is disappointed and dismayed by this behaviour but if they review the last year they can come to only one conclusion and it is that unionism has not changed in any way. The DUP has always opposed the Good Friday Agreement, its principles and underlying concepts. Now with the support of loyalist mobs they feel justified in stopping operating it. Many in Sinn Fein now question whether they have a partner in what they still call ‘government’. In the last year no DUP minister has said a word to lead them to believe they have.